Snack Girl is late to this party, but she is ready to rumble. Dunkin’ Donuts’ is one of my least favorite venues of all the chains that I review. Three years ago, I wrote this about one of their summer drinks - You Can De-Ice an Aircraft With This New WORST Drink Winner. mounds of fried eggs and slices of lightly salted, cherrywood-smoked bacon gathered into the sweet, sweet embrace of a “light and fluffy” split glazed doughnut. Maybe he drank a Coolatta before he wrote that article. Glazed Donut: Donut [Enriched Unbleached Wheat Flour (Wheat Flour, Malted Barley Flour, Niacin, Iron as Ferrous Sulfate, Thiamin Mononitrate, Enzyme, Riboflavin, Folic Acid), Palm Oil, Water, Dextrose, Soybean Oil, Whey (a milk derivative), Skim Milk, Yeast, Contains less than 2% of the following: Salt, Leavening (Sodium Acid Pyrophosphate, Baking Soda), Defatted Soy Flour, Wheat Starch, Mono and Diglycerides, Sodium Stearoyl Lactylate, Cellulose Gum, Soy Lecithin, Guar Gum, Xanthan Gum, Artificial Flavor, Sodium Caseinate (a milk derivative), Enzyme, Colored with (Turmeric and Annatto Extracts and Beta Carotene), Eggs], Glaze [Sugar, Water, Maltodextrin, Contains 2% or less of: Mono and Diglycerides, Agar, Cellulose Gum, Citric Acid, Potassium Sorbate (Preservative), Artificial Flavor]; Fried Egg: Egg Whites, Water, Egg Yolks, Modified Corn Starch, Natural Sauteed Flavor (Soybean Oil, Medium Chain Triglycerides, Natural Flavor), Salt, Artificial Butter Flavor (Propylene Glycol, Artificial Flavor), Xanthan Gum, Citric Acid, Coarse Ground Black Pepper; Bacon: Pork, cured with: Water, Sugar, Salt, Sodium Phosphate, Smoke Flavoring, Sodium Erythorbate, Sodium Nitrite. I love “artificial butter flavor” in the morning. With 730 mg of sodium and 8 grams of saturated fat, this sandwich will start your day in exactly the wrong direction. I took exactly one bite of this and tossed it out. It tasted like the ingredients - chemicals. How do you screw up a donut, bacon sandwich? 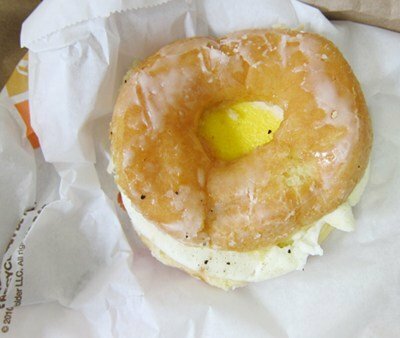 DD seems to have achieved the impossible – an inedible donut, bacon, and egg sandwich. The egg was like rubber and the whole thing tasted off. Even the bacon was strange! I don’t know why DD finds it necessary to create something like this. They seem to be ignoring the obesity health crisis and perhaps they think it is funny to promote food that resembles a toy. They did get a lot of press out of creating this combo - and, perhaps, they wanted BUZZ. I'm going to buzz right past my DD in protest. Ewww, that is so gross! I love Dunkin Donuts, but not this kind of stuff! Yuck!!! "...perhaps they think it is funny to promote food that resembles a toy." I'd have appended a smiley face to my comment, but honestly, I don't find any of this craziness amusing. People (Americans?) are having a tough time eschewing these salty/sugary/fatty tricks, but purveyors of this, excuse me, crap, just keep pushing more of it on us. Stop eating these "food-like substances". Vote with your wallet and with your feet. Food isn't something hilarious that we should make as unhealthy as possible; even in its more subtle Western-diet form, I contend that the I-can-eat-anything mentality kills hundreds of thousands of people each year. That sandwich looks really bad,and with the ingredients list...yuck. I like their iced coffee. I have tried a egg white sandwich,it has vegetables in it. I liked it. But now I wonder what other "mystery ingredients were in it". Maybe I should stick with the iced coffees. Well, they are a donut shop, not exactly the kind of place one expects to find healthy food. @Mike aka Monolith - excellent point. Eww this reminds me of the KFC burger that using fried chicken as the bun. Why make something even more unhealthy? As much as I try to eat real foods, we all need a little treat now and then. But what other ingredients do you need for an egg besides egg and a bit of seasoning? That's just ridiculous. We don't have Dunkin Donuts here. Thankfully! I ate their egg white sandwich. It was good. I hope the nutritional info is correct. Whether you like ithe product or not, thankfully we are still free to choose what we would like to eat. 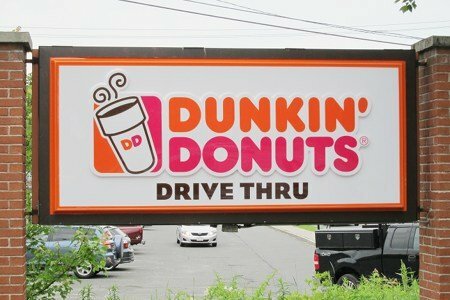 Would this be my choice, no, (I dont like the taste of their donuts) but DD is still free to create what they wish. I must admit, I do love my Dukin Donuts coffee! But, when I saw this on a poster recently, I thought it even looked gross (and thought Snack Girl will be on this one!) As one of our WW leaders said, if you go to DD for a coffee, get a coffee! (not all the other junk). They do have a good nutrition site where you can get the nutritional info on their products http://www.dunkindonuts.com/content/dunkindonuts/en/menu.html. Also, the "smart" menu isn't bad if you are in a pinch (i.e. veggie flatbread sandwich), but I must admit I haven't looked at the ingredients. Nothing in Dunkin Donuts is healthy not even the healthy options. The name isn't even good for you. Some places are just a no brainer, stay away. You actually don't have to get this disgusting sandwich, ya know? They never said it was a healthy choice. Just saying. Dear Snack Girl, I love Dunkin' Donuts coffee so It hurt's me that you are bashing them. It's one of my happy places. As far as donut's are concerned they are not here for nutrition, they are here for a snack(albeit not healthy) once in a great while, not as a steady diet. I am gluten intolerant and can't eat anything DD has. I do love the coffee, though. I don't buy the sweet, calorie laden frozen drinks. That sandwich looks disgusting!!! The just read a NYT article mentioning this foods like item. A study was found that even when health conscious people went to fast foods joints they picked unhealthy items. I wrote about my thoughts on this on my blog yesterday. Health conscious people don't eat at places like this when they do they probably order what they want and consider it a treat. Places that offer healthy items on their menu can't seem to sell them. Companies are going to sell what makes them money. They are a for profit after all. We are in the middle of a health crisis. I don't know how you fix it other than education. We sure can't rely on money hungry companies to do it. Donuts are NOT nutrition. They are a treat. Treats are indeed nice things once in a while -- repeat: ONCE IN A WHILE -- but this abomination of a sandwich is supposed to be breakfast. I thought "artificial butter flavor" sounded bad, then I read the ingredients list and saw "Natural Sauteed Flavor" - just, why?! As you and Kelly Lynn suggest, if this were made with a real fried egg, homemade bacon, and a fresh donut made at a corner bakery, it might not be that bad for a (very) rare treat. But the fried egg would have two ingredients (egg, butter), not ten. They make it because people buy it. It's the same concept as the celebrity gossip. If there wasn't a market it wouldn't be there. DD is the land of unhealthy food so I'm not sure why there is all the shock and dismay. NOW, if Subway were to create this I could understand the outrage - they brand is "health" (yeah, I used quotes! ).